Tendon injuries in runners are common. But they’re not always easy to heal. 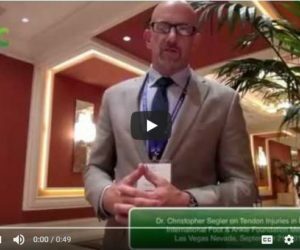 Dr. Christopher Segler was just lecturing to a group of physicians at the International Foot & Ankle Foundation meeting in Las Vegas where he was teaching doctors some of the keys to healing tendon injuries in runners. Here are two main takeaways for an injured runner with injuries like Achilles tendinitis or plantar fasciitis.